As of early November, a lengthy list of sitting senators and congress-people were voted out of their positions. During the midterm elections, a record number of women — especially women of color — were elected to new congressional positions. That’s a total of 117 women, including the youngest women ever (both at 29), the first Native American women, and the first Muslim women, among notable firsts. Six of those women will lead House committees. There are also now 10 LGBTQ members in Congress. In addition, more than half of US states saw an increase in early voting and most states saw an overall increase in voter turnout. The sheer volume of firsts and records suggests that the American people are ready for a change! In the months leading up to the midterm elections, it likely felt like a lot of changes happened in terms of immigration. Even for an experienced immigration lawyer, the changes have been a lot to follow. In the early months of the current presidency, a travel ban was instituted on Muslim-majority countries, causing immediate strife for out-of-country travelers. After that, the current administration has made moves to try to end Deferred Action for Childhood Arrivals (DACA), which helps those who were brought into the US as children. The current administration has also separated children from migrant parents at the border and held them in separate detention centers — even after a court order was issued to allow the families to reunite. A caravan of immigrants seeking entry to the US — many of whom are seeking asylum — have been stopped at the US/Mexico border while requests for legal entry are processed. Of course, the other ongoing immigration story is that of the President’s campaign to build a wall along the US/Mexico border. Toward the end of 2018, he went so far as to claim he would declare a state of emergency and use FEMA funds to get the wall built. He has also pulled money from the Department of Homeland Security’s budget to be used by the US Immigration and Customs Enforcement (ICE), much of which went toward detaining immigrants. The long and short of it is that immigration concerns have been in the news with increasing frequency leading up to the midterm elections. Fortunately, with the myriad changes in both the House and Senate, we are likely to see the broad-scale stance on immigration shift. There is no way to say for sure what changes will happen. However, the House now has a Democratic majority, which is a distinct flip from before the midterm elections. This means a shift in power and a shift in priorities. More importantly, it means a stronger voting power in terms of fighting against the stricter immigration policy changes the current administration is trying to push. We may see new legislation that pushes back against recent changes that have tried to make immigration requirements more restrictive. You can also reasonably expect that the conservative groups will continue pushing a stricter stance — with commensurate policies — despite no longer being the majority in the House. You can also anticipate immigration becoming an even more prevalent topic in the news as we get closer to the 2020 presidential election. It’s going to be a key topic on both sides of the political fence. With Democrats taking control of the house, there is a larger group of lawmakers there to push back and provide balance. With a president who has made immigration a central issue for his campaign platform, you can anticipate that he and his administration will keep pushing for immigration change. A lot of change has already been happening in regards to immigration, and it’s not likely to slow down in the push toward the eventual presidential election. If you have questions about immigration rights, immigration law, or immigration services, it’s important to work with someone who keeps up with all the changes. 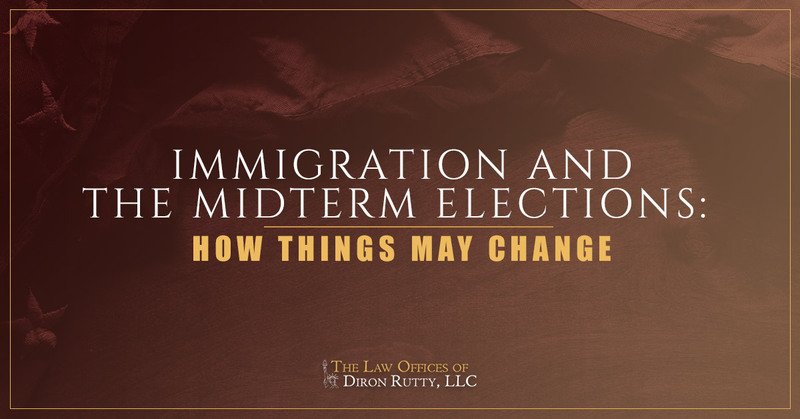 Connect with the Law Offices of Diron Rutty, LLC today to work with an experienced immigration lawyer in the Bronx and across New York City.